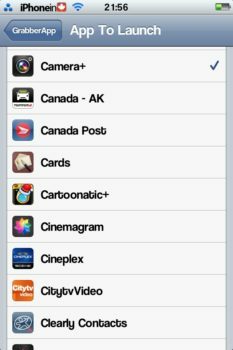 With iOS 5.1 came a cool new way to get to the native Camera app on your iPhone and iPod Touch. You just push up on the new “Camera Grabber” icon, on the lockscreen, and you’re instantly ready to snap a quick photo or video that precious moment in a hurry. This is a great feature, but not everyone uses the camera on their iPhone as much as some others, and a lot of folks who do, use a 3rd party app to take their photos. Not long ago, I reached out on Twitter, asking if anyone knew of a tweak to change what app opens, when you use the Camera Grabber. I didn’t get the answer I was looking for until yesterday. GrabberApp is a new tweak in Cydia that allows you to set any app you want, to open when you slide up the Camera Grabber. It is very easy to use and set up. After installing the tweak, you just go to Settings, enable the tweak, and choose what app you want to use. 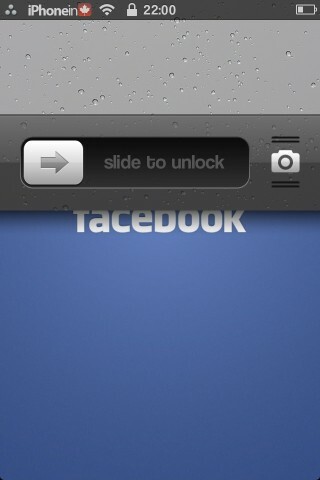 This tweak doesn’t need to respring when making changes, so making adjustments is quick and painless. 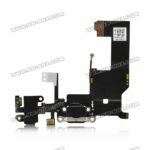 Apple did great work on the camera grabber in iOS 5.1, but what if we prefer some other camera app to launch instead of the default camera app? GrabberApp allows you to launch *any* app you want directly from the camera grabber, with all the required changes, the Default.png that shown while dragging and more. GrabberApp will also work perfectly with passcode-owners, GrabberApp will bypass your passcode while launching, and when you’ll close your app, the device will request your passcode. 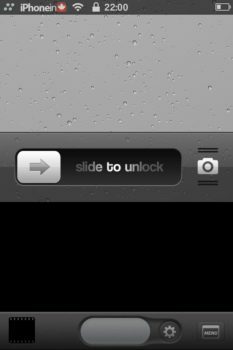 If you do not have iOS 5.1 or higher, an additional free tweak will be installed to add camera grabber function to your lock screen. From my experience, this tweak works great. It does not slow down, or cause any stutter to the system animations, and always launches the app I expect it to. This was designed for use with the iOS 5.1 Camera Grabber, but I am actually using it in iOS 5.0.1, with “Camera Grabber For iOS 5” tweak, and it is working great. 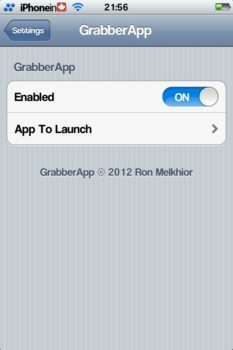 GrabberApp is a free tweak in Cydia, in the Big Boss repo.